How Car Dealership Spray Painting Attracts More Customers. The branding of dealerships is crucial in promoting the sale of vehicles because image is important to customers. Astute property managers know that a pristinely coated showroom is good for business which is why high quality car dealership spray painting is essential. 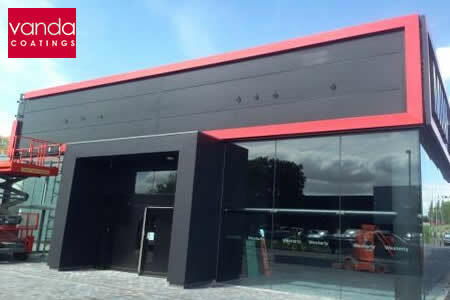 With this in mind, the Mini dealership in Exeter was being brought up to date with new corporate colours and logos and Vanda Coatings were chosen to carry out the work. The main contractor was understandably concerned about overspray on Porches, Jaguars and BMWs as these dealerships were in close proximity to the Mini premises. Consequently, one of our Contracts Managers visited the site before the project began to assess the situation. He was able to put the contractor’s mind at ease because it was clear the Mini dealership was far away enough for overspray not to be a problem. Furthermore, our experienced operatives were going to use the HVLP method of spray painting rather than an airless sprayer because it is more controllable. Nevertheless, preparation is taken very seriously at Vanda and our Contracts Manager assured associates that all adjacent surfaces would be masked off to protect items from any possible overspray. Vanda were given the go ahead on the project and the first thing our team did was to jet wash the metalwork before any coatings were applied. This was to ensure the following layer would stick to the substrate which amounted to approximately 400 metres squared in total. A coat of primer was then sprayed on to all the surfaces to seal them then layers of top coat werespray painted on to the metal cladding using the HVLP method. The result was a fantastic, black with red detailing in a contemporary finish as can be seen in the top right photo compared with the photo below it which was pre-painting. The main contractor was so happy with the work that Vanda were asked to paint spray some extra metalwork. This included doors inside the showroom which were re-coated in a different paint, some more cladding and about 100 metres squared of perimeter fencing. 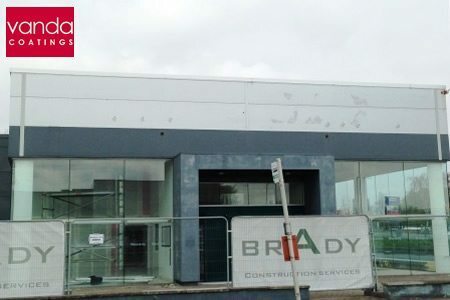 Much of the exterior car dealership spray painting was completed using cherry pickers because some of the surfaces were 10-12 metres high. Since working at height can be dangerous, we ensure all our operatives are trained and hold PASMA and IPAF certificates.